Back in March of last year, Land Mobile reported on the results of a competition run by the Department for Digital, Culture, Media & Sport, through which £25m was awarded to six projects around the country in order to help them “pave the way for future 5G roll-out”. As related at the time, the scope of these projects covered a variety of potential use-cases, situated in a number of different environments, again spread out across the UK. They included, in no particular order, 5G Rural First, 5G ‘smart tourism’, Liverpool 5G – which is focusing on healthcare – the Worcestershire 5G Consortium, and something called the 5G rural integrated testbed. As exciting as all those projects have the potential to be, possibly the most glamorous, albeit in the loosest sense of the word, however, is the AutoAir 5G testbed, recently rolled out at Millbrook proving ground in Bedfordshire. Autonomous and connected vehicles are, after all, the headline use-case for advocates of next-generation mobile broadband technology, as well as the thing which the public seems to be most excited about (alongside massively increased data rates for downloading episodes of Game of Thrones). More to the point, however, automation, once it is fully rolled out, will likely revolutionise the roads system, introducing new models of car ownership and production, transforming town planning and so on. This in turn will likely have a fundamental impact on society as a whole. Officially launched in mid-February, the AutoAir consortium is made up of a number of different partners from across the digital communications and automotive sectors. These include Millbrook itself, as well as Blu Wireless, Real Wireless, DenseAir, the University of Surrey’s 5G Innovation Centre and the R&D arm of motorsport behemoth McLaren. The lead organisation on the project, however, is Airspan, which specialises in network densification, as well as what it calls “integrated backhaul solutions”. Speaking of the history of the project, and what its partners hope to achieve through it, Airspan chief strategy officer (and DenseAir CEO) Paul Senior says: “The industry had been lobbying for some time prior to the initiative, specifically around supporting UK business in relation to 5G. He continues: “Regarding AutoAir in particular, the first thing which we needed to sort out was the environment in which the testing was going to take place. We got in touch with Millbrook and found that it gave us exactly what we needed in terms of testing new radio technologies, alongside different kinds of network architecture on a repeat basis. We also needed somewhere that was open for anyone who wanted to come and use the testing facilities. According to Senior, there are two broad areas of learning that the project is pursuing. The first is around the ‘densification’ process for the provision of 5G along transport corridors, parallel with which is the testing of millimetre wave access at “160 miles an hour”. This is relevant not only to future imagined networks operating on major road systems, but also to the provision of gigabit services to trains, something which would clearly be impossible to look at outside of a high-speed, highly repeatable environment such as Millbrook. The other key work area is in relation to the provision of contiguous coverage. This was demonstrated at the official opening of the testbed earlier this year, during which attendees were bussed around the site in order to view the 23 small-cell base stations currently dotted along the perimeter of the Millbrook speed circuit. While on the aforesaid bus (OK, up-market coach), passengers were also able to witness relatively low-latency video footage transmitted simultaneously from other vehicles zooming around at the same time. This included several emergency services units, as well as a snazzy orange McLaren number, which ended up lapping us so many times that Land Mobile lost count. While currently having to operate via the use of pre-existing 4G and co-opted Wi-Fi technology, one element which Senior insists is “definitely 5G” at this point is the core network in relation to the density of the cells as they are positioned around the site. This is something which, he says, will offer a valuable insight into the nature of the system architecture and the “backhaul topology”. According to Senior, the overall rationale for the testing has been conceived of in two parts. The first of these is the hastening of the automation process itself, through ongoing interrogation of the infrastructure, as well as a core focus on the safety aspect. The second, meanwhile, centres around what exactly can be achieved with this technology. Speaking of the advantages of Millbrook in relation to this, he says: “One of the things you get from building a high-capacity network on a site such as this is the ability to have real-time feedback as the testing is taking place. He continues: “The second piece is exploring what new capabilities we can bring to autonomous vehicles, particularly when it comes to building along major roadways. For Senior, this information will in time be used to help develop an economic strategy in terms of 5G infrastructure build-out for roads across the UK. The concept from Airspan’s point of view, he says, is to explore a ‘neutral host’ model, through which the system would be able to complement pre-existing MNO coverage. 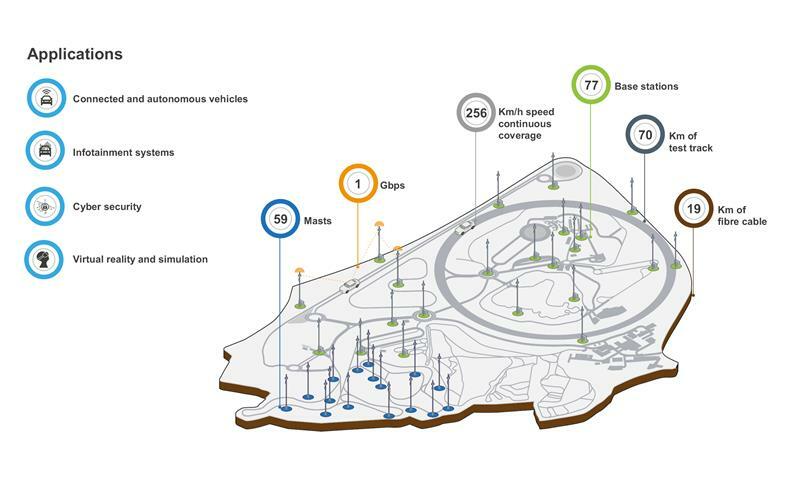 It’s obvious that Millbrook is the ideal location for the AutoAir project to take place, providing as it does not only a suitable environment for the infrastructure roll-out, but also the opportunity to test endlessly across a variety of different terrains. That being the case, what does Millbrook get out of the initiative, and how is it feeding those benefits back into the wider automotive industry? Speaking of the proving ground’s involvement in the project, Millbrook’s Stoker says the process began around 18 months ago, in response – at least initially – to a competition organised by the Centre for Connected and Autonomous Vehicles (CCAV). He continues: “In the first instance, people talked about the civil engineering aspect – literally how difficult it was to actually create that kind of environment just in terms of concrete, power, ducts in the ground, planning permission and the rest. We thought if we provided that, people would come and take advantage of those facilities. According to Stoker, the fateful meeting between Millbrook and Airspan took place following his “two-minute pitch” at a CCAV event, after which the two organisations started to talk in earnest. This ultimately led to AutoAir, which it is hoped will not only go some way to solving the challenges faced by the industry, but also help to position the UK as a world leader in the field of automation. “The idea of automation is a major concern to the automotive industry,” says Stoker. “Something which they’re having to deal with alongside electrification, ongoing debates about air quality as well as what’s currently happening between the UK and the EU. At the moment they’re in the process of establishing expertise, with innovations coming from various points along the supply chain. As with so many things related to 5G, the journey to fully autonomous vehicles is likely to be long and circuitous, especially if one considers just how much travelling on British roads can tax even the most experienced and careful of human drivers (I challenge anyone to drive through central London during rush hour without at least one expletive passing their lips). 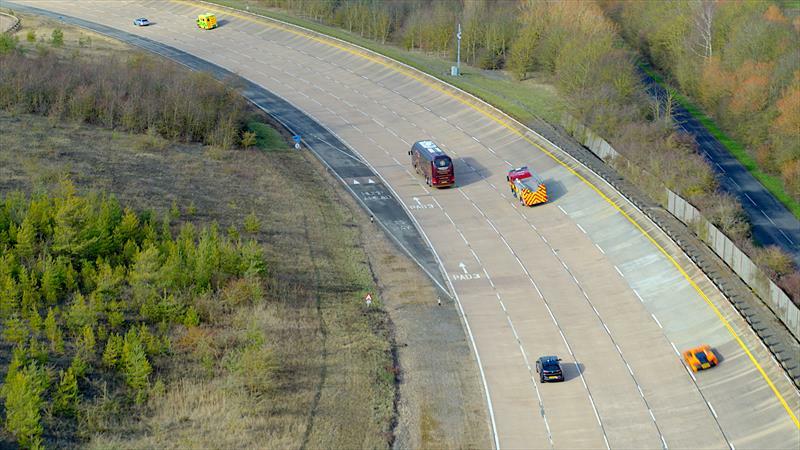 The roll-out at Millbrook, however, as well as the efforts made by the other five consortia around the country, signal just how serious the UK is about getting the rubber on the road. The Society of Automotive Engineers recently updated its ‘levels of driving automation’ standard for self-driving vehicles. At level 0 to 2, a “human in the driver’s seat” is still very much required, with functionality broken down into ‘warnings and momentary assistance’ (level 0), ‘steering or brake acceleration’ (1), and ‘steering and brake acceleration’ (2). Features at these levels include automatic emergency braking, lane departure warning, and lane centring and/or adaptive cruise control. Things get far more interesting, however, at levels 3 to 5, with the latter two of which not requiring a human presence at all. Functionality at level 3 – which may call on the driver to intervene if required – consists of ‘traffic jam chauffeur,’ while 4 includes ‘local driverless taxi’. As with level 4, level 5 dictates that ‘pedals/steering wheel may or may not be installed’, but with the vehicle being able to drive everywhere in all conditions. Needless to say, the last two are the true game-changers.